I hope you had a super weekend...mine was jam packed! I feel like I need a couple of days to relax after it, lol! Friday I was busy shuffling our cars around, I won't get into the depressing details, but both our cars were in the shop and Josh's needed to go on Friday (YIKES!). Let me just say it was quite an expense. Saturday Mike and I went to David's Bridal with Ashley. After trying on a few dresses, she found the one she liked, so we decided to buy it. Don't you just love when the tell you if you buy the accessories today you will save 10% (only today! ), so that is what we did (I couldn't pass up some savings!). All in all the damage wasn't too bad. Here is a picture of Mike and Ashley on the way out. (They had to order her dress, since they didn't have her size in stock). We then had an appointment to check out a wedding location at Club West Golf Course. We got the tour and the price list (check out the photo of Mike looking at the pricing for dinner, lol!). I wonder what it would be like if $ was no object? So after that I came home to take a nap, lol! I was exhausted. But it is good to be getting some of this big stuff out of the way. I have not stamped in over a week (can you believe that?). I have been trying to get my stamping mojo back. So Saturday night I decided to just start stamping, since I needed several thank you cards. I had such a struggle...nothing looked right to me, so I apologize in advance if my cards are just mediocre this week. Here is the thank you card I made for the girls in my office. I kept the same layout from yesterday and changed the color and paper. 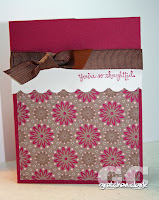 These are super easy cards to make (especially if you have to make lots). Last night was our family night...we finally finished the leftovers from Easter. We usually watch Survivor after dinner, but when we sat down to watch it...it wasn't on *bummer. 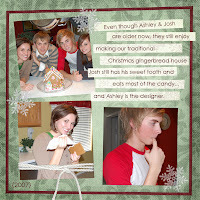 * We ended up watching American Idol again, since Ashley missed it. I am still so excited about my birthday gift...this is what I got *happy face* Josh is showing me how to use all the features (he has the Nikon D-40). My family is already getting tired of me taking random photos of them, lol! so...Ashley is planning on getting married this October, so Mike and I have a wedding location to check out with her and an appointment at David's Bridal this Saturday...so my fingers are crossed that I will get some stamping time in. Just a quick post...I have been busy visiting and shopping with my mom, I haven't been doing any stamping, so I don't have anything new to show you. I am going to take a couple days off from blogging (sorry!). But be sure to check back on mid week! I will have some new stuff to post. Today is a quick post, since I have to get a ride to work with Josh (Mike took my Expedition, since his car is being worked on...again!). Last night I whipped these up to take into work today for my co-workers. I borrowed this set from my friend Lori, isn't it cute? I think I may have to add it to my wish list (which keeps growing). 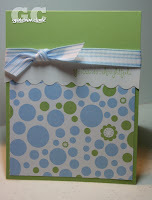 I used the criss cross template from Nichole Heady http://www.papertreyink.com/. I then filled them with m&m's and Snickers...yummy! My mom is arriving tonight at 8pm and I still have lots to do before she gets here. Happy Tuesday everyone! I hope you didn't get pinched yesterday...can you believe I forgot to wear green? oh well. I think I am starting to feel better (other than my plugged up ears...*hate that*). My mom is flying in on Thursday to celebrate my big 4-0 birthday (am I that old?) and I have lots to do before she gets here, so I hope my energy returns real soon! If not for cleaning...for some major shopping! Can you believe that Easter is this Sunday? Boy that came fast! I will hopefully have some time to stamp some Easter gifts this week...stay tuned for that! Here is another digi page using a lot of the same elements from yesterdays layout. It really feels good to be getting my Christmas scrapping done! Thanks for visiting my blog! Enjoy your Tuesday! It was inevitable...I caught Josh's cold, I felt pretty miserable all weekend and not really great today...but I would rather go to work when I am sick and have a day off when I feel good. So off I go with my Dayquil. Since I am gearing up for my digi scrapping class next week, I spent the weekend brushing up on my Photoshop skills from my previous classes, so this week will be "Digi Layout Week." In the past I have tried to scrap chronologically, and well just got overwhelmed...so my new approach is to scrap current photos, and work on older stuff as time permits, that way I can remember what was going on at the time. We will see if this helps me get caught up *wink*. Here is a layout from this past Christmas. 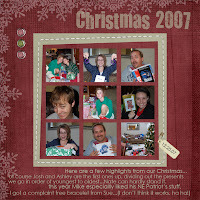 I got all my Christmas photos scrapped over the weekend, since I was sitting at the computer with my box of Kleen-X. Thanks for visiting and have a wonderful day! oh yeah...Happy St. Patty's Day! Happy Friday! It's the weekend...yeah! 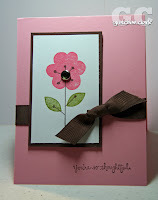 Today's card is using my Tart n' Tangy set again...It is such a fun set! And when you pair it with the Summer Picnic Paper...too cute! 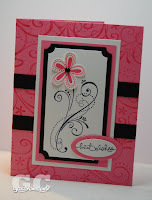 I am hoping to get some time to stamp and digi scrap this weekend, maybe I will post a few of my digi layouts next week. I am getting excited for Jessica Sprague's 3rd class "Diggin in Deep" (registration starts next week), check out her website here for class descriptions and registration. 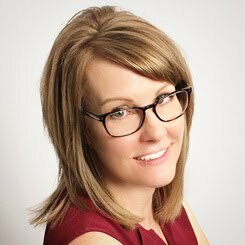 I know I have raved about her classes in the past, but if you are interested in learning how to use Photoshop and scrap digitally, these classes are so helpful, and she is a great teacher! The weather has been so nice! I think it was 85 degrees yesterday, my mom is coming for a visit next week from CT (where it is still cold). I know she is anxious to enjoy some of this gorgeous weather...Thursday is almost here mom! I hope you are having a terrific day! 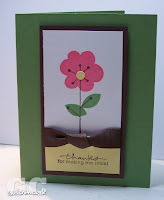 Toady's card is a simple one using one of my "old stand-by's" Happy Harmony. I really love this set and use it quite a bit (guess I am getting my $ worth from this one, lol!). I wanted to use my Purely Pomegranate on the flowers, and really like the boldness of it! Of course I had to pair it with Chocolate Chip (my favorite!). Yesterday was such a fun day! After work I took Ashley, Josh and Sharon (Josh's girlfriend) out for lunch at Quizeno's...yummy! Then Ashley and I headed off for our pedicures, such a treat! Sometimes it is nice to be pampered! I really like how my tootsies came out, I even splurged and got a flower (you cannot see in the picture, but there is a mini diamond in the middle...fancy-shmancy! ), they are all ready for my opened toe shoes! Happy Wednesday! The other day I pulled out my Papertrey set "Green Thumb" which I haven't used in a while. Once I decided on a color scheme the card just seemed to come together. I added a pink brad and then I popped up the middle flower with a SU! dimensional. Today is a half day at work...yippee! I love those kind of days! Ashley and I are going to grab some lunch and then get a pedicure after work. It is getting to be flip flop time (well it is pretty much flip flop time all the time here in AZ) and the tootsies need some attention! Don't you just love getting a pedicure? When I paint my nails, I get the polish all over my cuticles...that is why I leave it to the professionals! I hope you have a great day, and thanks for stopping by! Well the weekend is over *sad face*...are you ready for a new week? I am amazed at how fast the weekends go by! Mike and I went to a horse farm on Saturday, now that was an experience! I am really scared of big animals and well, horses are pretty big! luckily they were all in their stalls and I could go as close as I wanted too, which wasn't very close. Saturday afternoon between cleaning and grocery shopping, I was able to get a few minutes to stamp. I really like the new summer picnic paper from SU! and the Tart & Tangy stamp set. 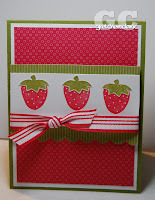 I decided to use the strawberry stamp and the red dotted paper (which kind of reminds me of a strawberry). It is such a summery card! Makes me kinda hungry for some strawberries! I hope you have a great day and thanks for visiting! 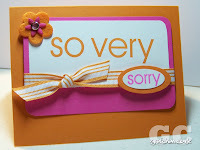 I saw this card on Splitcoast Stampers (made by Krystie_Lee) a few days ago and I "cased" it! I had to dig out my Heartfelt Thanks set and dust it off and then inked it up, I had forgotten all about this lonely set. 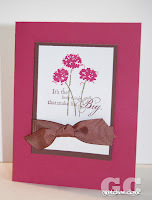 I love the simplicity of the card, and the color (I think Soft Sky is my favorite right now). I don't know about you but I am so glad the weekend is here! Isn't it nice to have the whole weekend ahead of you? I hope I can get some stamping time in! 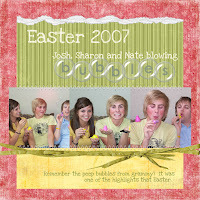 show Jon & Kate Plus 8 I love it! Does anyone else watch it? It’s documentary style show about the lives of a young couple (Jon & Kate Gosselin) and their 7 yr.old twins and 3 yr. old sextuplets. Yes…sextuplets. SIX! It’s so honest and adorable and hilarious and if you ever feel overwhelmed in own your life, trust me, just watch one episode of the two of them hearding their 8 kids around and you’ll walk away with a smile thinking ”if they can do it, I can do it.” It’s just a great show about a wonderful family and the kids are so stinking cute! Mike, Ashley and Josh even like watching it with me. Check it out! 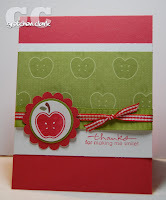 So here is a card I made using the new set from Stampin'Up's mini catalog called tart n' tangy...I just LOVE the matching paper! This card makes me feel like summer is right around the corner. Last night Mike and I visited some friends of ours from church, we brought dinner over and had such a nice time visiting, and I did remember my camera so I snapped some photos of their dogs, it made me really consider getting a one...which is not like me! But they were so cute and one of them was so friendly (the other was kind of skiddish around new people). Have a wonderful Thursday...The weekend is right around the corner! supplies used (all SU! ): Tart n'Tangy/So Very (retired) stamp sets; Ruby Red/Whisper White cardstock; Summer Picnic Designer Paper; Ruby Red/Old Olive Marker; Old Olive ink; Scallop/Circle/Corner Rounder Punches; Red Striped Ribbon. It is Wednesday...we made it to the half way mark, whoo hoo! Here is a card I made using the bird image from the Always stamp set. 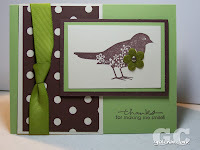 I have seen so many cute cards with this bird, but when I started stamping...I just couldn't get it to look right. After quite a while of playing around with the layout and color scheme, I decided to just put it together and leave it alone. Once I did that the card seemed to grow on me. It is hard to see from the photo, but I added a small felt flower from the Accent & Elements (love those things). Tonight Mike and I are bringing dinner over to some of our friends house. One of them just had some major surgery and is confined to the house and pretty limited to what he can do, so I am sure he is getting pretty bored! Hopefully we will break up the week a little for the both of them. 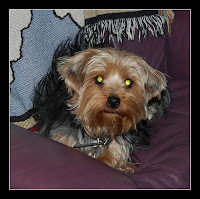 Plus they have the cutest doggies (Yorkie-Poo's). Hopefully I remember my camera and snap some photos. supplies used (all SU! ): Always/Small Sayings stamp sets; Certainly Celery/Chocolate Chip/Whisper White Cardstock; Chocolate Chip ink; Au Chocolat Designer Paper (retired); Celery 5/8 grosgrain ribbon; Accent & Element felt flower; Brass Brad.